The claddagh ring gets its name from a small Irish fishing village. The village was called Claddagh and was where Robert Joyce, who is credited with making the first claddagh ring lived - around 4 centuries ago. The young man was a humble fisherman who was one day, captured by pirates on the sea and sold as a slave. Robert could bear the physical hardships of slavery but, the mental torture of being separated from his beloved was unbearable. With the hope of gaining some mental stability he decided to make a ring for his beloved. The dream of gifting it to her when he would one day be a free man, gave him some motivation to carry on. He hoped that the features of the ring would capture his true feelings for his beloved. A few years later, the young man was freed from slavery and rushed back to his village. He was overjoyed to see that his beloved was patiently waiting for him, they embraced each other and Robert slipped the ring on her finger. True love had been proved and very little remained to be said, the couple were soon married and spent the rest of their life together. The ring came to be known as the claddagh ring and the story spread around, people came to know of the features of the ring. Interpreting the features of the claddagh ring reveals, the true mind and heart of the young man. The hands denote friendship and togetherness, the heart signifies love and the crown symbolizes loyalty. The world today respects this ring and hails it as history's most meaningful jewel. Kaisilver conducted a long and thorough study of the ring and it's significance. The findings from this study were used as inputs to finalize the design specifications of our cladagh ring. 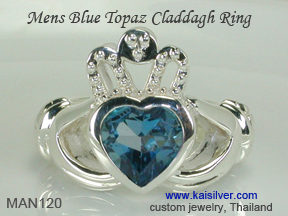 It is widely accepted that the Kaisilver claddagh ring is the best rendition of the 4 century legend. 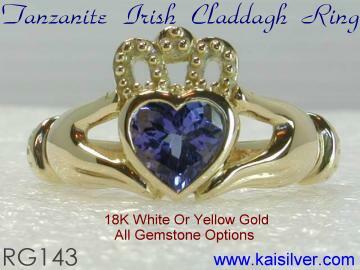 We craft gold and silver claddagh rings with the same quality of workmanship and gemstones. Contact our experts at sales@kaisilver.com for any queries that you might have, they will be glad to help you even if, you intend to buy nothing from us. An impressive claddagh ring for men, expertly crafted in gold and 925 silver with your choice of gemstone. Wear one of the most meaningful jewels in history ... more. One of the rarest gems to be used in jewelry, tanzanite is at least 1,000 times rarer than diamonds. 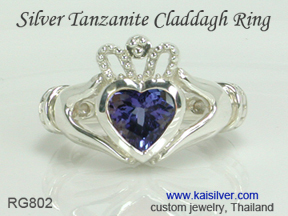 The Kaisilver cladagh ring with tanzanite gem is an awesome jewel ... more. Moonstone the gem with a mystic shimmer is loved across the globe. 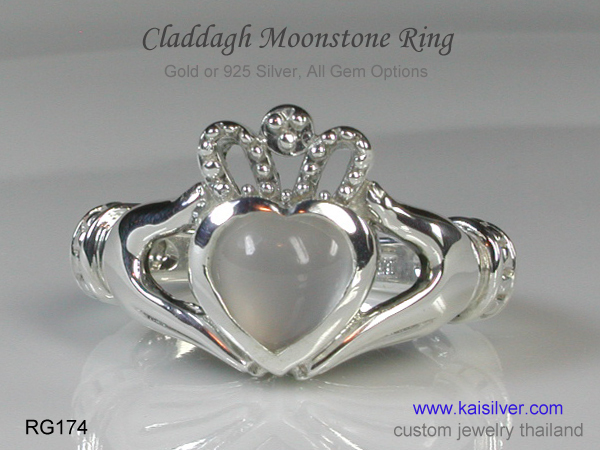 Kaisilver moonstone claddagh rings can be ordered in gold or 925 silver. Each gem is immaculately cut to bring out the best shimmer and glow in the gemstone, read about it ... more. A custom made cladagh ring from Kaisilver. Rutilated quartz is an interesting gem that, internally preserves fine rutile needles - the needles are perfectly preserved and untouched for millions of years. Available in gold or 925 silver ... more. 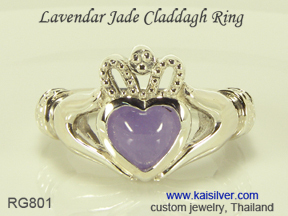 A silver or gold claddagh ring with lavendar jade, an interesting color for the jade but, you could request for a green jade gem stone in your claddagh jade gem stone ring ... more. Tanzanite is widely acclaimed as the gem find of our times. 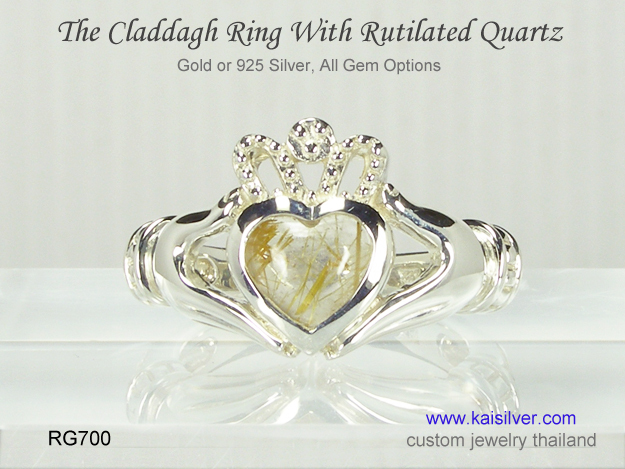 Kaisilver celebrates this rare African beauty and combines it with the most meaningful jewel of all time, the claddagh ring ... more. 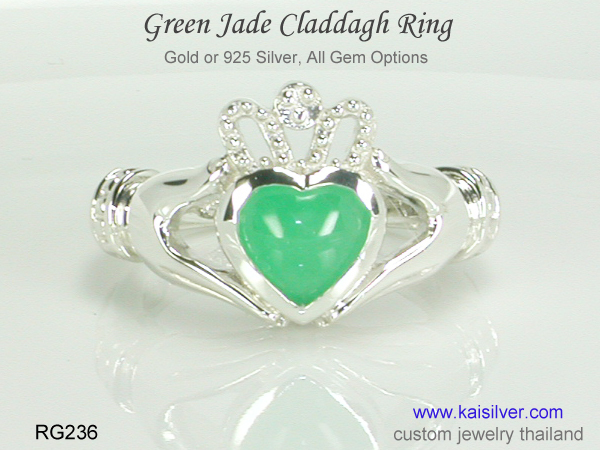 A gorgeous jade claddagh ring with a natural green jade gemstone. Skilled artisans work on each gold or silver claddagh ring to ensure that, every ring retains the meaning of the first ring made about 4 centuries ago. Review the complete report ... more.